The following statistics may shock you. I know that on first hearing about the 2012 study conducted by RTI International and Blue Shield of California Foundation on 1,430 7th grade students, I was shocked. Being a survivor of dating and domestic violence myself, I knew just how serious the problem was for women. I knew that among women between the ages of 15 and 44, domestic violence is the leading cause of injury. And that 25% of women in the US experience domestic violence in their lifetime (Mayor Daley’s Press Office and Lake County Crisis Center). But I had no idea the same culture of violence had permeated Junior High to the extent to which it had. The RTI study showed that 75% of the 7th grade students surveyed were already dating and 1 in 6 students reported being a victim of physical dating violence in the last 6 months before the survey. Additionally, 37% of the students reported being a victim of psychological dating violence. From ChooseRespect.org we find that the statistics go downhill from there. 54% of high school students report dating violence among their peers, and 1 in 3 teens report knowing a friend or peer who has been hit, punched, kicked, slapped, choked, or otherwise physically hurt by his or her partner. 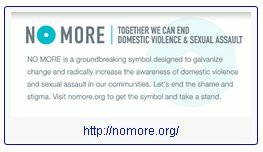 And saddest of all, nearly 80% of girls who have been physically abused in their dating relationships continue to date their abuser. The RTI study concludes that “parent-child communication is considered a protective factor that reduces the risk for teen dating violence.” However, it has been my experience that women both young and old, don’t talk about it, at least not in an informative, useful way. After all, it’s not for “polite” company. We’ve all heard, “All he’d have to do is hit me just once, and he’d be gone!” Yeah right. It doesn’t work that way. The subject is far too complicated for that proffered solution. • Get angry when I don’t drop everything for him or her? • Criticize the way I look or dress, & say I’ll never be able to find anyone else who would date me? • Keep me from seeing friends or from talking to any other guys/girls? • Want me to quit an activity, even though I love it? • EVER raise a hand when angry, like he/she is about to hit me? • Try to force me to go further sexually than I want to? • Shout at me/Call me names, telling me I’m stupid, worthless & can’t get along without them? So ladies, let’s all be part of the solution. Let’s break the isolation and pass the truth along. If you see your relationship within the lines of the questions above, you need to break the isolation, tell someone and break the cycle of abuse (thehotline.org) (alanon.alateen.org). If you see a friend, pass it along, because only in breaking the isolation can we all be truly free.